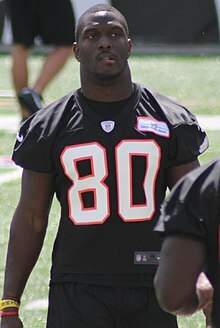 Orson Charles (born January 27, 1991) is an American football tight end and fullback for the Cleveland Browns of the National Football League (NFL). He played college football at Georgia. Charles attended Riverview High School before transferring to Henry B. Plant High School in Tampa, Florida for his senior year, where he was a teammate of Aaron Murray. During a recruiting visit to the University of Florida in 2008, Charles accidentally dropped the school's 2006 National Championship Trophy, breaking the Waterford Crystal football. He played in the 2009 U.S. Army All-American Bowl. Charles was named a finalist for the 2011 John Mackey Award on November 21, 2011. Charles was drafted by the Cincinnati Bengals in the fourth round, 116th overall, of the 2012 NFL Draft. In his rookie season, he played all 16 games, starting 6 of them, accumulating 8 receptions for 101 yards. In 2013 Charles played primarily at fullback; He played 13 games but started none and recorded one catch for eight yards. On September 23, 2014, Charles was signed to the New Orleans Saints practice squad. On June 16, 2016, Charles was signed by the Detroit Lions. He was released on October 4, 2016. On May 31, 2017, Charles signed with the Kansas City Chiefs. He was waived on September 2, 2017 and was signed to the Chiefs' practice squad the next day. He was released on October 7, 2017. He was re-signed to the practice squad on October 25, 2017. He was promoted to the active roster on November 28, 2017. He was waived by the Chiefs on May 3, 2018. On July 30, 2018, Charles signed with the Cleveland Browns. He made the Browns final roster as the team's fourth tight end. Despite being listed as a tight end, Charles had lined up primarily as a fullback throughout the 2018 season. He appeared on the 2018 Pro Bowl ballot as a fullback, and Browns coaches have signaled they view him as such. The Browns placed Charles on injured reserve with an ankle injury on December 13, 2018. On April 3, 2019, Charles re-signed with the Browns. Shortly before the 2012 NFL Draft, Charles was arrested for a DUI. On March 31, 2014, Charles was arrested for wanton endangerment in Richmond, Kentucky. Charles was pulled over by a police officer after another driver called in a complaint that Charles had shown a gun multiple times. In February 2015 Charles pleaded guilty to wanton endangerment and will enter a diversion program. ^ Birkett, Dave (June 16, 2016). "Detroit Lions signing TE Orson Charles". Detroit Free Press. Retrieved June 16, 2016. ^ "Lions sign TE Clay Harbor, release TE Orson Charles". DetroitLions.com. October 4, 2016. Archived from the original on December 21, 2016. ^ Thorman, Joel (June 1, 2017). "Chiefs sign two players including TE Orson Charles". ArrowheadPride.com. ^ "Chiefs Roster Down to NFL Mandated 53". Chiefs.com. September 2, 2017. Archived from the original on June 3, 2018. ^ "Chiefs Sign Eight to Practice Squad". Chiefs.com. September 3, 2017. Archived from the original on June 3, 2018. ^ "Chiefs Sign TE Neal Sterling To Practice Squad, Release TE Orson Charles". October 7, 2017. ^ "Chiefs promote TE Orson Charles to roster, sign DL to practice squad". USAToday.com. November 28, 2017. ^ Alper, Josh (May 3, 2018). "Chiefs cut a pair of players". ProFootballTalk.NBCSports.com. ^ "Browns sign 3 players". ClevelandBrowns.com. July 30, 2018. ^ Edwards, Josh. "Browns' depth chart against the Panthers". 24-7 Sports. ^ "Browns elevate LB Xavier Woodson-Luster to active roster". ClevelandBrowns.com. December 13, 2018. ^ "Browns sign TE/FB Orson Charles". ClevelandBrowns.com. April 3, 2019. ^ a b "Bengals' Orson Charles arrested". ESPN.com. This page was last edited on 11 April 2019, at 01:18 (UTC).